Sharing a name with the beautiful daughter of the Titan, Atlas is an orchid with a similarly beautiful flower known as the Calypso. Taken from the Greek word which means ‘concealment’, this orchid is pretty hard to find and is very rare. Although this orchid is very small, growing from 2 inches to a maximum of only 8 inches, its beauty is regarded as one of the best in the orchid world. 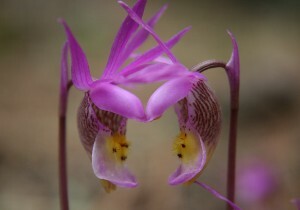 The Calypso bulbosa also known as the Fairy Slipper or the Venus Slipper is considered to be endangered in many parts of the United States. It can mostly only be found in undisturbed montane forests where rainfall is lush and the temperature is cooler. If you find a Calypso, you must leave it alone because it is such a rarity and moving it will kill it. This particular species of orchids are very difficult to cultivate because of the way it lives. Unlike most orchids, this plant practically has no leaves. Instead it has a partner fungus that helps it create food. This particular fungus lives in its roots and provides nourishment for it. It is virtually impossible to cultivate a Calypso orchid without the help of this particular fungi. Another impressive thing about the Calypso orchid is the way it spreads its pollen. Although it has a beautiful flower and incredible vanilla scent, it does not produce any nectar. It is pollinated by fooling bumblebees with the hair-like features on its flowers. They act as deceptive tools that seem to offer nectar. Its flowers come in shades of pink, purple and even red with a white lip with several pinkish-purple spots on it and whitish hair-like follicles on its center. You wouldn’t mistake it for anything else once you see it in person. And consider yourself lucky if you do because these orchids are simply rare. Calypso orchids when encountered in the wild should be left alone. Enjoy their beauty for a moment and then move on. Take a picture but never try to move it for this would just kill it. Consider yourself lucky and be on your way. Have you ever seen a Calypso orchid in person? Do you have any pictures? Please leave a comment below. To choose an orchid to grow yourself (not one found in the wild), you should go through orchid growers. My husband and I were hiking in the Welcome Creek wilderness in Western Montana yesterday and I’m pretty sure that I found a Calypso orchid. it was all by itself, underneath some other plants didn’t see any others throughout the entire hike. I do have some pictures, a bit blurry but if I could send one to you maybe you could help identify. WE FOUND ALMOST 25 IN COLORADO FOOTHILLS SOUTH OF BUFFALO CREEK THIS WEEKEND. AMAZING!!!! These are absolutely my favorite wild flower. In the Rocky Mtns of Canada they grow wild and are very plentiful. We would pick a few for my mother for mothers day every year. Now we just snap a picture and inhale their perfume. Back in the 30’s and 40’s we lived on a 40 acre mountain farm about 10 miles north of Newberg, Oregon. A large portion of the acreage was wooded with both old growth and second growth Douglas Fir. The woods were dark and produced many wild flowers including “Lady Slippers” (calypso orchids). My mother was an avid flour enthusiast and she figured out how to transplant these wild plants by not disturbing the plant from its mulch and fir needle locale by taking whole hands full of the ground cover with it and transplanting under garden fir trees and mulch. Very little sun, no wind, lots of rain and it worked.